Miniplanten.nl is the ultimate online platform for supplying plant wholesalers and retailers with the Dutch assortment of mini plants. With our advanced e-commerce platform, we guarantee our customers of the freshest possible mini plants of the highest quality sourced from the best growers. We also provide all partners in the supply chain with the highest attainable standard of supply efficiency. How to grow in miniplantes? Miniplanten.nl has the answer. Digital ordering, fast delivery, efficient supply and distinctive ability. That’s what wholesalers offer to their customers and what demand from their suppliers. Within the miniplant category, it was difficult to realize that to date; For each species, another breeder is needed, with all the complexity of it. How to easily and quickly convert this into a profitable product group with growth potential? 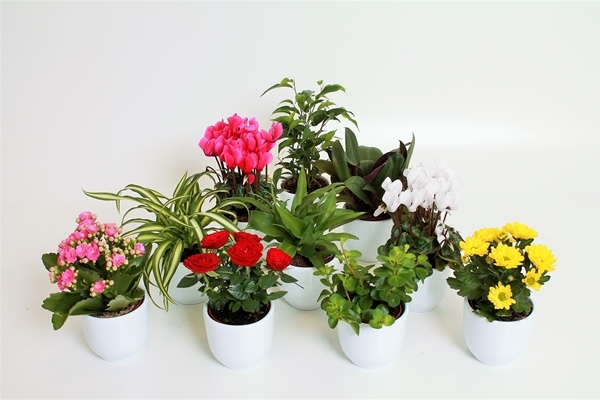 Miniplanten.nl provides the total solution for the mini plant display table. The ultimate mini plant bench puts a high-quality, frequently replaced assortment of these plants and beautifully coordinated ceramics within reach of consumers. The uniform look of Miniplanten.nl’s diverse range of products makes it easy and tempting for consumers to select their purchases. A larger pot volume (7 cm) provides twice the moisture buffer to reduce losses due to desiccation. Getting this done requires agreement among multiple parties. In actual practice, however, this kind of cooperation is often missing so the ultimate mini plant bench is seldom realised. This is a pity since a well-coordinated mini plant bench will make a strong contribution to both the returns and the positioning of the garden centre as a plant specialist. Miniplanten.nl has a total solution for this. Miniplanten.nl’s product range lends itself perfectly for sales campaigns. Would you like to delight your consumers with a new and varied selection of mini plants every week? Would you like to reduce losses in your fresh plants display and increase the attractiveness of its prices? The super deals from Miniplanten.nl make this possible.